Adrian Durham joined talkSPORT in 1999 and became host of the popular Drive show on the station in 2006, which he currently presents with former England cricketer Darren Gough. He also writes a weekly column on football for the Daily Mail Online. Football is all about opinions, and few people hold more opinions about more topics than talkSPORT's host of the Drive show, Adrian Durham. Whether it is the quality of Arsenal's 'Invincibles' or the supposed brilliance of manager Jose Mourinho, you can bet that Durham will have a view on the matter. Just because everyone else agrees that Pele is the greatest footballer who ever lived, doesn't mean that Durham will agree with that view - and he will supply a whole range of fascinating reasons as to why he is right. 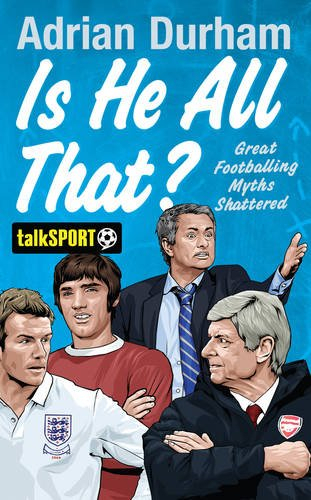 Packed with lively comment on so many of the questions that football fans love to argue about, this book is full of the one thing that all football supporters can relate to: passion. If you ever want to provoke a lively debate, Is He All That? is sure to provide you with plenty of material. It will make you question your assumptions about the game, make you think and make you laugh.